Today, the Mediterranean is on the frontlines, perhaps it is the frontline, of a global struggle for peace and development. In solving long-term conflicts, in achieving genuine development and reform, in all these ways, the Mediterranean is engaged in a great enterprise. The results will impact the entire world. And we who are on that frontline look to the friends of peace and freedom for support and partnership. I would like to stress from the Greek point of view, the core challenge: ending the problem of Cyprus. Given the headlines from elsewhere in the region, some of you may wonder if this is, indeed, still at core of solving regional conflicts. Let me say that it remains central to the region, as well as the international agenda. No other conflict has cast such long shadows on our globe, or been used to cause such division, or promoted such bitterness. The time has come to find a viable and long-lasting solution to the problem of Cyprus, in a way that could guarantee Mediterranean stability and serve as a precedent for solving other regional disputes, most prominently the Palestinian-Israeli one. Greece supports a solution to the problem of Cyprus for a number of important geopolitical reasons. First, partition is not deemed beneficial for either country in the region. The 1947 Indo-Pakistani partition is a good example. Though accepted by both sides, it was accompanied by an arms race that has ultimately turned into a nuclear rivalry. Having this model in mind, it is not difficult to realize that an ongoing arms race in Cyprus would guarantee further instability in the wider region. Another major concern of Greece is the possibility of the emergence of fundamental Islamic tides in Northern Cyprus. In the case of partition, radicalization of Islamic elements in Northern Cyprus as a result of economic or political unrest is a possible development that runs contrary to regional security. Additionally, the possibility of the permanent division of the Cypriot capital will constitute a detrimental development for Israel and the Palestinians, as the current status in Nicosia is similar to the pre-1967 partition of Jerusalem. The Cyprus partition would constitute a bad precedent for the Israeli and Palestinian claims over an undivided Jerusalem, which is one of the major issues to be tackled in any final Arab–Israeli peace agreement. On the contrary, a federal solution would unite Nicosia and could strengthen Israel's and the Palestinians' case for a similar preferred position on the final status of Jerusalem. 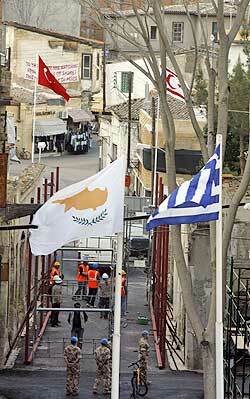 "Cyprus Unity Hopes Rekindled," Kirsty Hughes, BBC News, June 9, 2008. Though in a different context, a shared rule arrangement in Cyprus could also be the model for a broader regional structure between Israel and its closest neighbors, namely the Palestinians and Jordan. That said, it would be useful if more American and European diplomacy were directed towards the Cyprus issue. An agreement on the political future of the island will undoubtedly have positive spillover effects for the Eastern Mediterranean and the wider region. Bringing Greece, Israel, Cyprus, the Palestinians, and possibly Turkey together would constitute a significant contribution to regional security. Peacemaking and multilateral cooperation is a step toward a regional future of hope. But it is only one step. The young people of the region know we need to revitalize the engines of peace to promote growth and real development. When regional leaders talk to their youth, they can hear their energy and keenness and belief in the future. They are asking them to make a difference, to have the courage to make a difference, to act now to make a difference.